I just got these great sun shades for the car from Mr. Bene. These come in so handy when you are traveling. What I love about these is that there are no suction cups needed. They have a sticky material on the back that fits snugly to the window. Stick these up when the sun is beating into the vehicle and you need to block these sun. They are a netted material so you can easily see through them but they help shade you or the children from the sun. This is really nice if you will be in the care traveling for some time, it can keep the sun off your baby or children in the backseat. They are really easy to use. Bendable so you can fold them up and store them easily when you are not using them. These are a must have in our van! ★ Ever wonders why your child always screaming in the back seat of your car? Probably because of the Sun Glare and Heat. Thinking about tinting your car windows but worry about High Prices and Visibility issues? 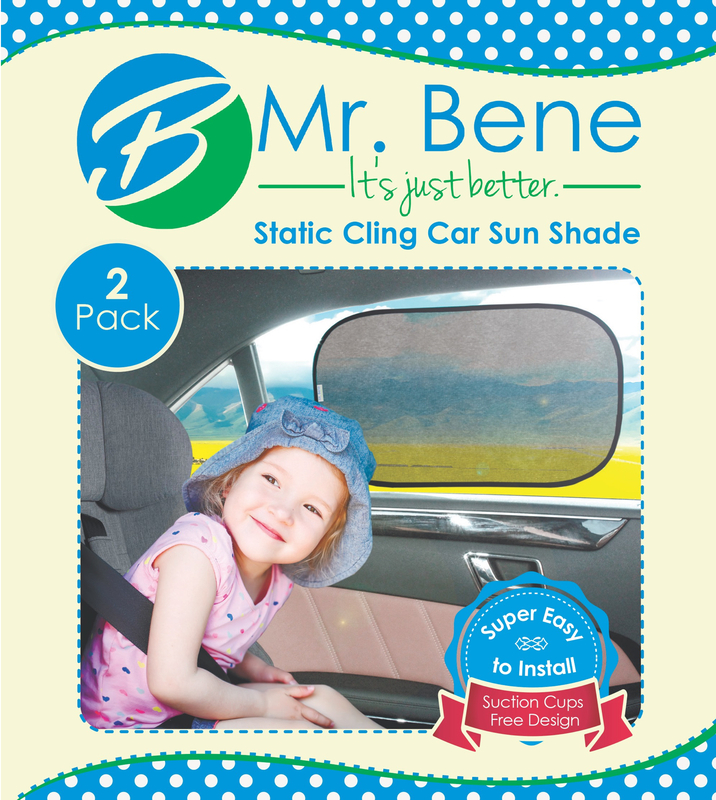 Mr Bene’s Revolutionary NO-Suction-Cups Design Static Cling Car Sun Shade is the best option for you. ★ Dual Layers Design provides Best Protection (UPF 30+) and Blocks Over 97% of Harmful UV Rays – Keep your kid always happy riding. ★ Revolutionary NO-Suction-Cups Design allows you to apply and remove the sunshade by one hand just in seconds. It works better and lasts longer. ★ Avoid the hassle of dealing with always-get-lost and never-stick traditional suction-cups design. ★ Comes in a pack of Two 19″ * 12″ Car Sunshades. – Fit Most Cars. ★ Best Value on Amazon. Mr. Bene Static Cling Shades comes with a FREE Bonus – Premium Quality Pouch to store your car window shades when not in use.